An elegant, piano-black soundbar is the perfect partner for every long-suffering TV forced to crank out audio by itself for so many years. British company Orbitsound has taken the wraps off its new surround sound system, the Orbitsound SB60 which is, to all intents and purposes, that soundbar your TV has been looking for. The hand polished, high gloss exterior has been produced from 20 individual wooden components to minimise distortion and connects up to your TV with just one optical wire. 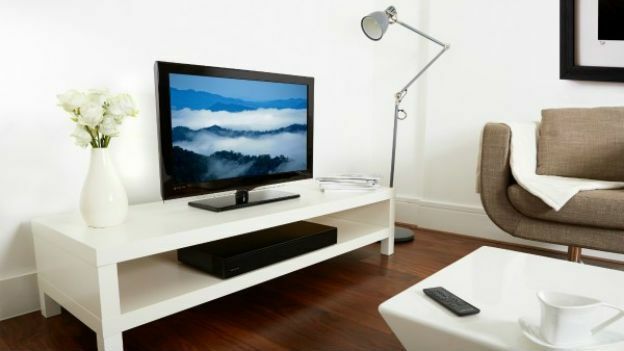 It measures 600mm wide and 300mm deep and will support a TV if you're looking to save on a bit of space. Predictably, the audio is pretty fine as well. Front 2x2-inch speakers are supported by a further side-firing 2x2-inch speakers giving panoramic audio and a 5-inch down-firing subwoofer providing the bass. “The SB60 airSOUND Base has been developed for the love of TV. As flatscreen TVs become thinner, the sound tends to become inferior, leaving a gap in the market for consumers who want to enjoy premium sound from their TVs without sacrificing on convenience, simplicity and ease of use," said Peter Eckhardt, managing director of Orbitsound. "The SB60 airSOUND Base not only fills that gap but also brings to life the Orbitsound vision of reproducing sound as though the artist, actor or musician was in the room," he said. The Orbitsound SB60 is available now to buy at John Lewis for £299. Make sure you pick up the next issue of T3 to see how it fares against the competition in our review group test.